My connection to Sydney is incredible slow, apparently. I’m at my office where the ISP is listed as Hurricane Electric (???). @charlie. Thanks for doing the test ! 499ms ! That’s not good. The good news is that it doesn’t time out. But 499ms is not good for web applications. Did you try this from a commercial-grade connection? Hurricane Electric? Humm, maybe try an old-fashioned ping test from the command prompt. We found many tech companies and many tech start-ups in Chengdu. How can they run an internet business from there when the infrastructure is so inadequate? Help. This is mission critical. To answer your questions: the test I ran wasn’t from a commercial-grade connection and I was going through a firewall so there might have been blocked ports and so on. I have no idea what Hurricane Electric is, I’ve never even heard of that. Maybe Ben will know and offer his piece, he’s more knowledgable on local internet services than I am. Here’s a test I ran from home; not much better, though. Strange, as I mentioned above I routinely download at 400kbps+. Bad connection to Sydney, I guess. Never heard of Hurricane Electric. It could be some small ISP providing internet to buildings via a larger carrier, or it could just be an error or old entry in the APNIC database. This is the result from my office’s fibre connection. 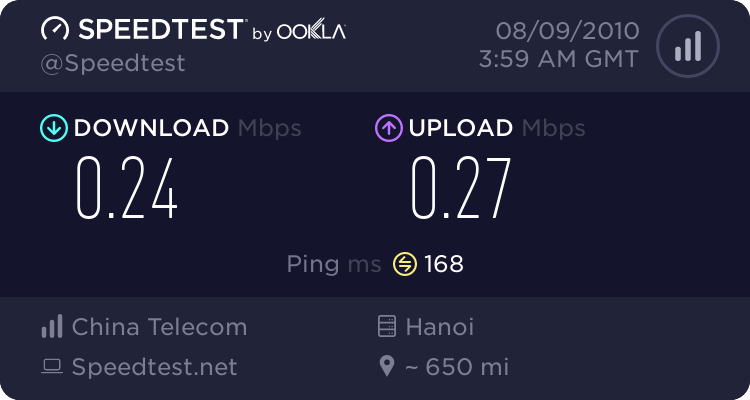 The result from my home China Telecom (CHINANET) DSL are the same as Charlie above. 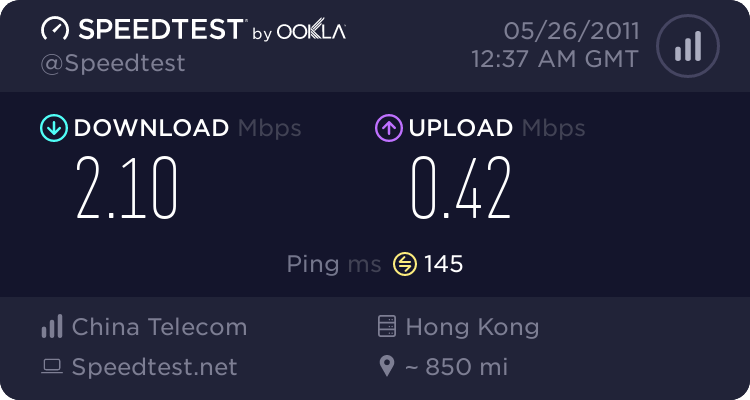 Here’s my ping test from home (China Telecom 2M ADSL). Here’s the same test when running through Witopia’s Los Angeles TCP 443 server. I’m a webapp developer. Moved to Chengdu a couple months ago. Internet speed is not great but I can get my work done. trudat, do you work in Gaoxin Qu? I’m a web developer also, I work there twice a week. I work mostly from home. But I am starting to discover places to work with free wifi. Finally made it to the Starbucks on Jinxing Road where there is a Carrefour. I’m slowly mapping places on my Google Map as I find them. Where is Gaoxin Qu? I would be great to meet another web developer. Gaoxin Qu is the tech-center located in the south of Chengdu. It’s a cool place that I recommend you check out some time. The coolest architecture in Chengdu is there – cool looking really modern office buildings and the like. There are a lot of IT/tech/web related businesses operating there. Dude, your Google Map is awesome. Great job with that. By Gaoxin Qu, do you mean the high tech zone where there is the Tianfu software park? I haven’t been down there yet. Yup, that’s exactly the place I’m talking about. Internet speeds are increasing! I posted here a few months ago that my ADSL account was capped just under 400kb/s but now the cap is gone and I’m pulling 500 kb/s downloads. DVD quality movies take about 30 minutes. This is really tremendously great since the price hasn’t increased at all and I’ve done nothing for the speed to increase. Charlie, where do you live and are you in a newer building? I’ve had the worst speed earlier this month. I live in Yulin, in a building that I guess was constructed a few decades ago. Not particularly new – there’s no elevator or anything. My Internet speed is officially rated as ‘poop’. Official. Speed certainly improved in my building. Beats my office! We apparently 3 ADSL lines running through here, in the middle of Tianfu Software Park, hahah. Pathetic. I’m moving back to Chengdu in September. 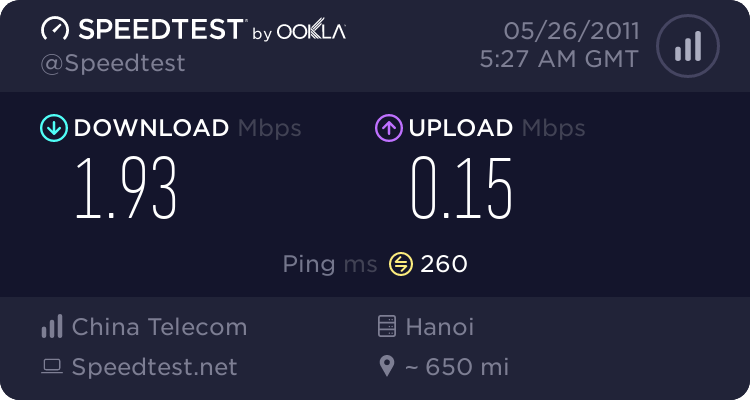 This time I want the best internet connection available. Last time I just used my roommates China Telecom, and it sucked. I heard somewhere they have 2 different options though (slower/faster – cheap/expensive). Is that correct? What are my options? Is the information above still up to date? I wanted to type money isn’t important, but paying 2-3k/month for fiber is a little bit over the top. I’d really like good speed and stability though as I’m a heavy downloader/gamer. Telecom is the best ISP in town as far as I know, but there are different levels of service. And even within the same level of service you can get wildly different results – I’m guessing depending on the wiring in your building and/or physical proximity to the ISP. I have a 4M Telecom residential connection at home and I cap out around 400-500k but I know others on the same connection in different parts of the city who get 150-200k max. That Google Map is awesome. I just found out where my apt. is going to be so I’m able to use that map & see what is nearby. Is it possible for me to make a private copy of it so that I can add my own places to it?